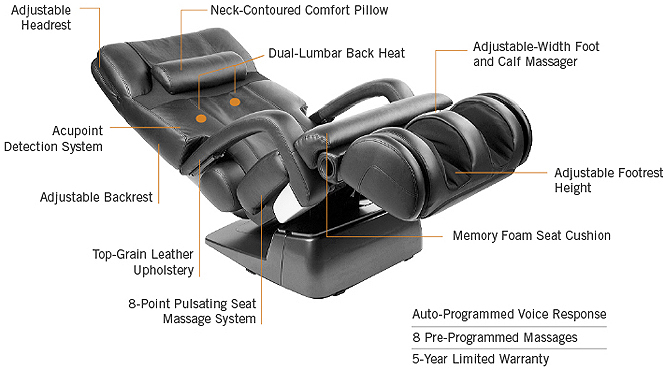 HT-7450 The World's First Zero-Gravity AcuTouch Massage Chair SALE $3799! 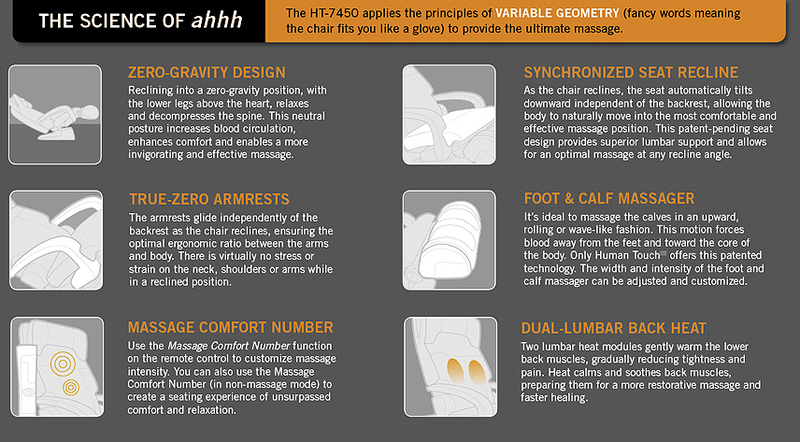 Let the AcuTouch® HT-7450 HT-7450 Zero-Gravity Massage Chair release you from the clutches of gravity and daily tension. With elegant, sophisticated design and the top of the line in our Human Touch Technology®, the HT-7450 is not only a marvelous piece of technology; it is also a great addition to the decor. There's no way to escape Earth's gravity. But now there's a way to escape the soreness, tension and fatigue caused by the effects of Earth's gravity constantly pulling the back. Introducing the Human Touch® 7450, the world's first massage chair that incorporates the latest advances in both back-care technology and massage to virtually defy the adverse effects of gravity. As the HT-7450 reclines, its back, seat and footrest move in synchronization to position the body in a virtually weightless state – the perfect posture for massage comfort. From there, the patented human touch massage system goes to work. It provides a deep, re-invigorating massage of the neck, back and legs. It leaves you feeling refreshed and recharged. The HT-7450 is the first chair of its kind and with its revolutionary design, numerous engineering advancements; back pain – and gravity – won't keep you down any longer. Please welcome the new addition to our established line of massage chairs! • Adjustable Headrest: Easily adjust the headrest to read, sleep, or just relax in absolute zero-gravity comfort. 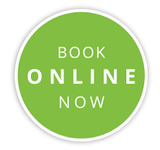 • Acupoint Detection System: Acupoint scans the entire length of the back creating a map of key pressure points to target during the massage to ensure an effective and targeted massage for all body sizes, types and pressure points. • Adjustable Backrest: You can adjust the backrest angle with the push of a button. Premium-grade leather is secured directly to the frame for maximum durability and aesthetics. • 8-Point Pulsating Seat Massage System: The precisely engineered pulsating seat massage targets the most important pressure points of the sciatic nerve along the buttocks and upper hamstrings to provide optimal lower back relief. • Memory Foam Seat Cushion: Now you can enjoy the unsurpassed softness and comfort of the same memory foam that cushions NASA astronauts as they lift off into outer space and that's found in today's most expensive beds. • Adjustable Footrest Height: You can adjust the height of the footrest to ensure your complete comfort at all times. • Adjustable-Width Foot and Calf Massager: Both the width and intensity of the foot and calf massager can be adjusted and customized. • Dual-Lumbar Back Heat: Two lumbar heat modules gently warm the lower back muscles, to help gradually reduce tightness and pain. • Neck-Contoured Comfort Pillow: The fine leather upholstered pillow with comfort foam precisely conforms to the contour of the neck for optimal support and superior comfort.